Underscoring that Iran has thus far complied with all its commitments according to the International Atomic Energy Agency (IAEA), he criticized the United States for resorting to a flimsy excuse to justify its withdrawal from the accord and pressuring other countries to violate it. He deplored that the United States threatens countries and international organizations with punishment if they comply with Security Council resolution 2231 (2015). He expressed appreciation for the efforts of the international community, the European Union, Russian Federation and China in supporting the implementation of the Plan of Action. He described Iran as a “meticulous guardian for a world free from violence” and called on those present to “quit imposing sanctions and end extremism”. “The world will not have a better friend than Iran if peace is what you seek,” he concluded. The representative of Iran, speaking in exercise of right of reply, said the Israeli regime has a long history of following an opportunistic policy to mislead others. It aims to divert attention from its inhumane and savage actions towards Palestinians and other Arab nations. Israel’s “showman” misses no opportunity to tell monstrous lies and distort reality. This is meant to distract attention from his regime’s killing of defenceless women and innocent children. He attempts to mask Israel’s face as the last apartheid regime in the world. “This is the only regime in the world that openly practices racism,” he said. No amount of lies will ever cover up the criminal nature of Israel, which is led by a corrupt leader who pretends to be progressive and democratic. He compared Israel’s fanaticism to that of Islamic State in Iraq and the Levant (ISIL/Da’esh) and the Nazis. A democracy for racists that crushes the true owners of Palestine is a mockery and a tyranny, he added. Israel is the enemy of democracy in the Middle East. Israel has violated 300 Security Council resolutions, and the United States has used its veto power a total of 44 times to shield Israel from Security Council resolutions. He said that Israeli Prime Minister Benjamin Netanyahu lied today when he presented evidence of Iran’s plan to obtain nuclear weapons. “Lying is in his DNA,” he said. Israel must cease its destabilizing conduct in the Middle East, its regular violations of Syrian and Lebanese airspace, and its airstrikes in Syria, which serve as support for terrorist groups. The time when Israel attacks its neighbours with impunity has passed, he warned. The representative of Iran, speaking in exercise of the right of reply, said the Minister for Foreign Affairs of Saudi Arabia had, a few days ago, levelled false allegations against Tehran. It was neither new nor surprising when the Minister said that Saudi Arabia supports the American strategy against Iran. What is amusing is that the Minister accused Iran of supporting terrorism, when everyone knows that Saudi Arabia supports terrorism in a blatant and widespread manner. He described Saudi Arabia as the world’s leading financier of terrorism, adding that suffering in Yemen is the product of Saudi machinations and manoeuvring. 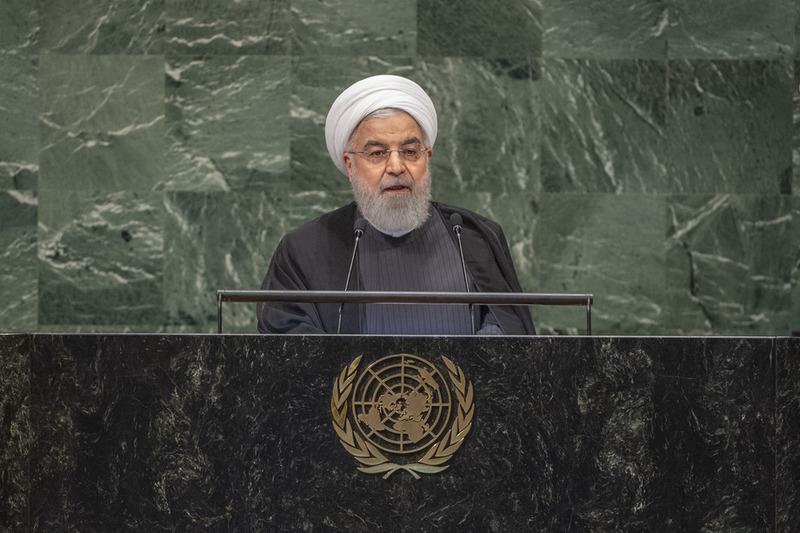 He wondered how Iran could have shipped ballistic missiles through a blockade to Yemen and voiced support for inter‑Yemeni dialogue under United Nations auspices. Emphasizing that Iran is a just and loyal neighbour, he said its door is open for dialogue to resolve problems for the benefit of the Muslim family. Replying to the statement by the Minister for Foreign Affairs of the United Arab Emirates, he reiterated Iran’s claim to the islands of Abu Musa, Greater Tunb and Lesser Tunb. Iran is willing to participate in negotiations with the United Arab Emirates to put aside any misunderstanding. The representative of Iran, taking the floor a second time, said the representatives of the United Arab Emirates and Saudi Arabia are negligent of the fact that repeating falsehoods, year after year, cannot alter the truth in the age of digital communications. The only way to restore security and tranquillity in West Asia is through dialogue, he said, adding that Tehran’s policy is based on greater convergence, mutual respect and good-neighbourliness.